creative savv: I want spring! I know, still January, but I want spring! I am so eager to get outside and plant seeds, rake up winter's mess, and begin to work on a new section of the yard. But this week is still cold and wet. So instead, I'm making out my gardening plans. I've gone through my seed packets, and begun to fill the gaps where I've run out of favorite vegetable seeds. I've picked up several packets at Dollar Tree, but will need to go to Home Depot for other varieties. 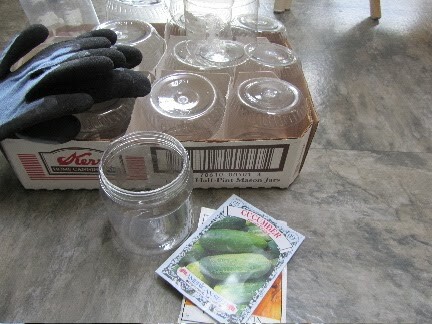 I have new gloves to begin the gardening season. I picked these up on clearance at the drug store in October. I need seed starting soil, but have a large selection of 9-cell seed starters, peat pots, and now am collecting empty peanut butter jars for larger seedlings. Most of my seedlings will do fine in the small 9-cell seed starters, but some plants need larger starting pots. I'm saving plastic containers to use as seed starters for plants like pumpkin and squash that develop large root systems quickly. I have over a dozen 10 and 16-oz. plastic, peanut butter jars, already. I'll drill drainage holes in the bottoms, and they should serve well for starting seeds this spring. I like being able to use these one more time, before adding them to the recycle bin. But I still have to wait another couple of weeks before starting seeds. So hard to wait! Are you doing any armchair gardening this week? Just a note -- Life is super busy for me this week. If I don't get back to your comments right away, give me a sec. I'm trying to check in and read once or twice a day. Things should settle down come Monday or Tuesday. Hope all is well at your end! I don't have specific garden plans, but I am enjoying looking at some beautiful seed catalogs. I've been pouring over seed catalogs, too. Does it seem like they come even earlier than they used to? I received 2 seed catalogs in early December. I am so glad when they come in December! I have to order right away. If they wait until February to ship to me it's too late; I've already planted things! that's a good point. I often forget that in some areas, planting starts much earlier than in our area. Happy planting! My hubby is the gardener around here. I'm thinking about treating myself to a little flowering indoor plant but not sure if I can find one that won't hurt my naughty cat won't eat. :) Spring is a loooooooooong way away for us. Our cats always loved chewing on houseplants. Have you ever tried growing cat grass or wheat grass for your cat? The vet said that the cats were likely chewing on the plants because they had hair balls. So many plants are toxic to pets, it's hard to find one that wouldn't cause harm, should a cat eat leaves from it. I got a kick out of this post today as my husband is always telling me how many months it will be till we can enjoy home-grown lettuce. It is amazing to read Brandy's comments and realize how different her seasons are--well, yours are, too--I think I forget how vast our country is. I think the planning is the most fun part! I forget just how much work the actual gardening will be, until I've got that sore back! I just want it to stop snowing, LOL! I keep forgetting that there is snow, and big snow, in places. I'll catch a weather forecast for the rest of the country and be reminded that it is still winter. Not like It's balmy here. But we just haven't had any snow this year.